PI-2: Designed for communication between only two points. 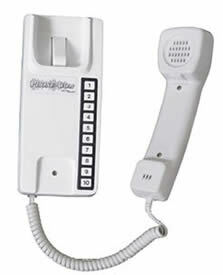 A single call button sounds a buzzer and illuminates an indicator lamp on the companion phone. Available singly or as a set with 40' of interconnect wire, fuse, terminal lugs and mounting hardware. PI-2 SET: Two station phone set, 40' interconnect wire, fuse, lugs, mounting hardware; 5 lbs. PI-10:For multiple station calling capability. Up to 10 phones may be interconnected, and each phone has 10 call buttons. Sold individually-- see wiring requirements below. Phone-Com Wiring: For PI-2, use 5 conductor wire. For PI-10, add 3 to the total number of stations to determine minimum number of conductors required.